We realized we never posted a picture of the outside of our house so here it is. Just kidding, here is our real house. 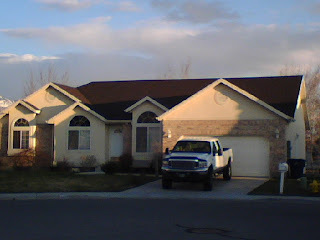 And no that isn't our truck, and I guess it is a good thing because it doesn't look like it would fit into the garage. I believe that if house number one is yours, then Christmas will be at your house this year...by the inside pool! In case you didn't get my voicemail, we'll be moving in next week since there is so much room! Congratulations on the new house, guys! We're so happy for y'all. Hmmm...I think I've seen it before. Didn't you say there was some storage space?